The perfect fall recipe that your family is going to love. 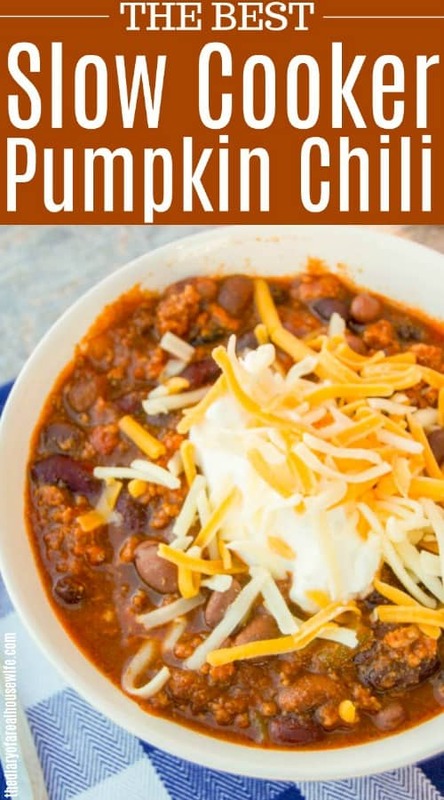 Simple Slow Cooker Pumpkin Chili is the perfect meal for a cool fall day and your house will smell amazing with this cooking all day! 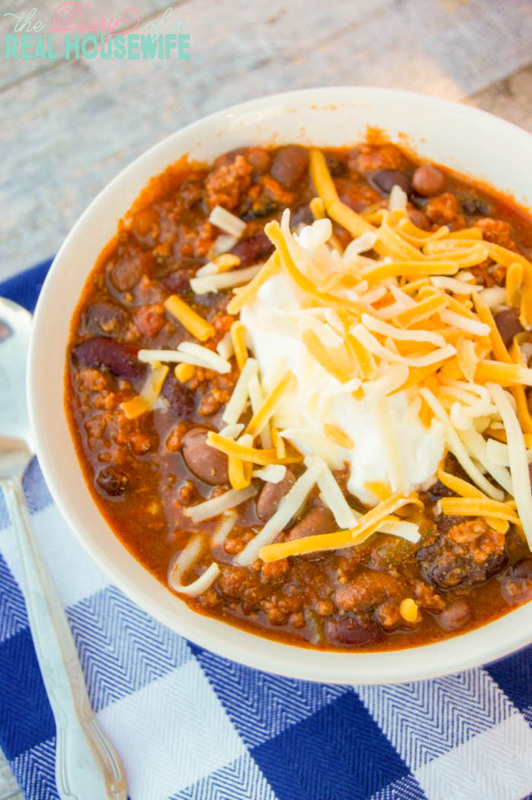 Chili and fall go hand in hand. When you add pumpkin to the recipe it’s makes it even better and the perfect fall dinner recipe. While my chili was cooking I headed out side with my family and got to spend some time playing in the backyard in the fall air and came it to have dinner ready and my house smelling amazing! 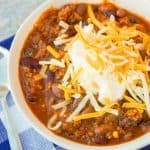 If you love chili as much as I do then make sure to check out all my other chili recipes next. Chocolate Chip Pumpkin Bread: Pumpkin bread is a must for the fall and adding chocolate chips makes it even better. Mini Pumpkin Pies: My favorite way to make pumpkin pie. These mini pies are so perfect for a party and they taste amazing. Pumpkin Spice Dump Cake: This simple recipe is dumped into a casserole dish then baked. It’s just that easy. Like The Diary of a Real Housewife on Facebook for more yummy recipes! Cook ground turkey, drain fat, and place into the slow cooker. Add remaining ingredients to the slow cooker. Cook on high for 4-5 hours or low for 8 hours. Hey so I’m just a bit confused. I was on my way to shop for the ingredients for this recipe and realized you haven’t put any measurements for the actual pumpkin purée. Thanks Anna! I must have messed something up during editing but it has been updated! I add 1 15 oz can to the chili of pumpkin Puree. Hope you enjoy it! Hi Eileen! This chili should make a good 6 servings. Are referring to weight watchers points? I am not sure how many this is. I don’t do weight watchers and I am not sure how they calculate points. Hope you enjoy the recipe! What are the tricolor beans? Are they kidney beans or pinto beans? Hi Amber! I used a can of that came with a blend of kidney, pinto, and black beans. You can add the same amount of any bean you enjoy! I hope you like this recipe!